Part five of my Field Only Armorial Roll project. Field Only Armory, Part Five. Click for full size, see text for details. A bit more gyronny this time and then into the lozengy, including the triangular lozengy barry. This set does contain one of the emblazons that I’m really not sure about and cannot find another version of anywhere online – Cwenhild of Cydllan Downs in the top left corner, “Gyronny raguly of four issuant from dexter chief ermine and vert.”. Raguly is the sawtooth lines of the green segments, but I’m unsure if the line difference should be on both sides of the central green section or just the top like I’ve done it. Opinions or links to other emblazons of this device, please? 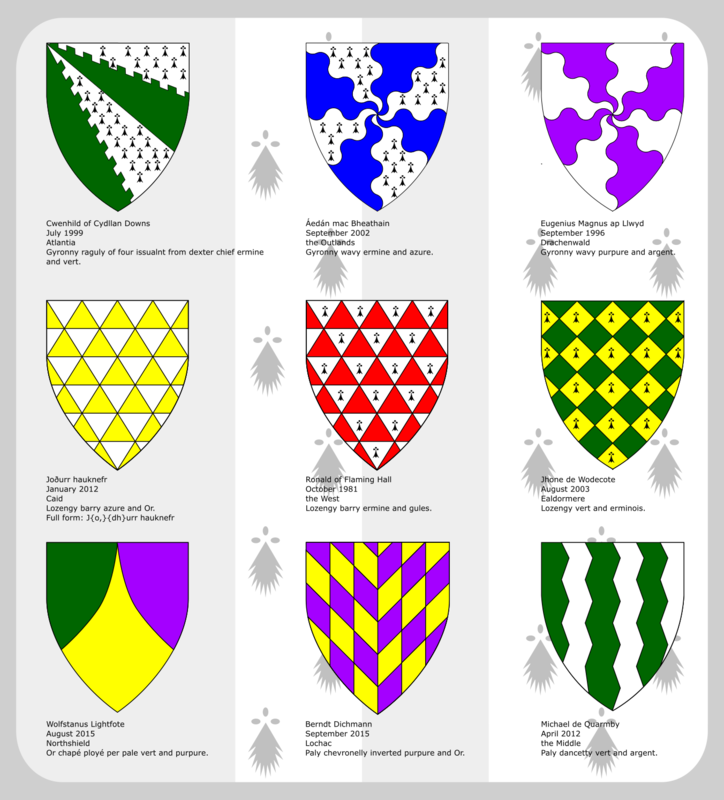 Favourites in this round would have to be Berndt Dichman’s “Paly chevronelly inverted purpure and Or” just for the striking design created by the stacked paly and chevronelly divisions, although I must confess I’m not usually a fan of purpure as a heraldic tincture for some reason. Michael de Quarmby’s “Paly dancetty vert and argent” also appeals, although I suspect I should have made the back-and-forth jagged edges of the dancetty a bit more prounounced for proper heraldic style – at a distance you could possibly mistake this for straight-up-and-down paly in the same colours.